Arias jury deadlocked: The jury in the Jodi Arias sentencing has deadlocked over whether she should get the death penalty after she was convicted of murdering her boyfriend. 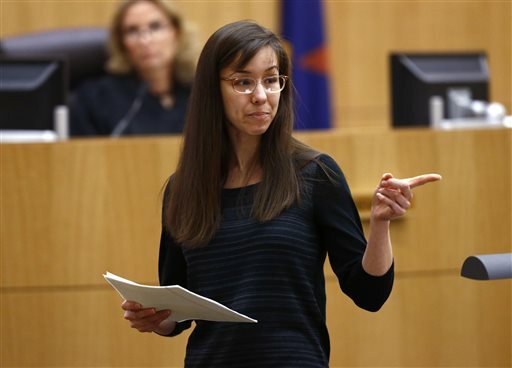 PHOENIX—Jurors in the Jodi Arias murder said Wednesday they were unable to reach a unanimous verdict on whether she should be sentenced to life in prison or death for killing her one-time boyfriend, prompting the judge to instruct them to keep on trying. The jury reported its impasse after only about two and a half hours of deliberations. Judge Sherry Stephens instructed jurors to try to identify areas of agreement and disagreement as they work toward a decision. Under Arizona law, a hung jury in the death penalty phase of a trial requires a new jury to be seated to decide the punishment. If the second jury cannot reach a unanimous decision, the judge would then sentence Arias to spend her entire life in prison or be eligible for release after 25 years. “If that happens, this jury would be dismissed and a second jury would be impaneled, and you’d literally have to go through the whole case again,” Romley said, adding the murder conviction would stand and the new panel would be considering only the sentence. However, the new jury would have to review evidence and hear opening statements, closing arguments and witness testimony in a “Cliffs Notes” version of the trial, Romley said. Romley also noted that if the current jury deadlocks, the prosecutor could decide to take the death penalty off the table. If that happens, the judge would determine whether Arias spends her entire life in prison or is eligible for release after 25 years. The panel heard emotional comments last week from Travis Alexander’s family as the prosecutor argued the 32-year-old Arias should be executed for his gruesome killing. The same jury of eight men and four women convicted Arias of first-degree murder two weeks ago.Arias stabbed and slashed Alexander about 30 times, shot him in the forehead and slit his throat in what authorities said was a jealous rage. Arias claimed it was self-defense. Arias said her lawyers let her down by not calling more witnesses who could have bolstered her claims that she was a victim of domestic violence at Alexander’s hands. Following her conviction last week, Arias told a local TV station that she preferred the death penalty. However, she said Tuesday night that she changed her mind after a tearful meeting with family members, realizing her death would only cause them more pain. “I felt like by asking for death, it’s like asking for assisted suicide, and I didn’t want to do that to my family,” she told the AP.